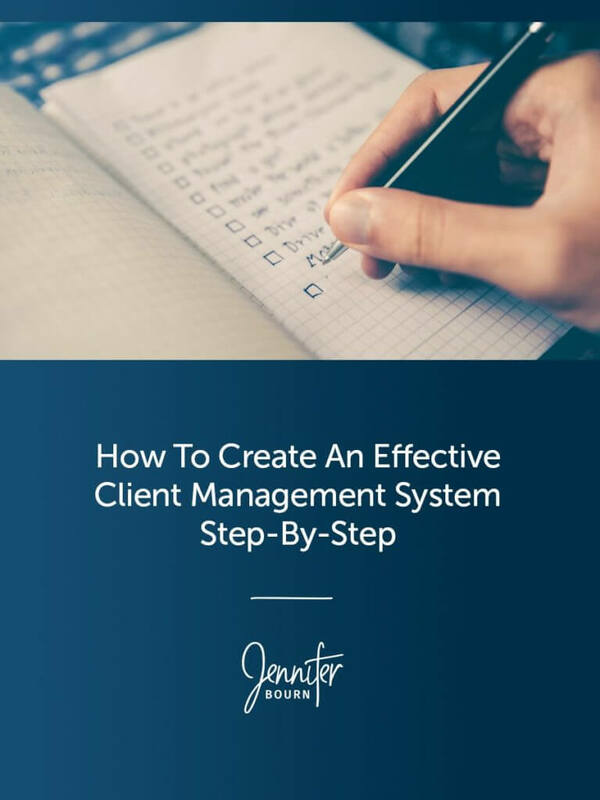 In only five steps, learn how to create a client management system that manages the education, support, and care of your clients to make sure they feel valued and have an extraordinary experience. A client management system like Profitable Project Plan manages the education, support, and care of your clients to make sure they feel valued and have an extraordinary experience. Client management is about improving the project experience, simplifying the process, exceeding expectations, and reducing stress for the client. It is also about reducing distractions, mitigating obstacles, and fostering greater trust, which leads to smoother, more streamlined projects and easier project management for you. Adding a client management system to your freelance business creates successful client relationships because it is about the client — ensuring they are happy, answering their questions, providing support, helping them feel good about their decision to hire you, and guiding them through the process so they are comfortable and satisfied. The very first step in creating a client management system is understanding what the client actually needs to be managed for, how your work together will happen, and the repeatable process you follow with each client. Begin by documenting your process from signed contract to the completion of the final deliverable and achievement of the final milestone. The goal here is to have a clear outline of each step or phase of your project. Second, figure out how to best help your client throughout the process from start to finish. The focus at this point is on streamlining their experience, making things as easy and as clear as possible, and removing any potential obstacles. What does my client need to know right now? Identify the critical information clients need to actively participate in the process, feel comfortable with what’s happening, and be confident in their decision-making. What does my client need to learn during this step? Identify things that may be unfamiliar or new to the client like language and terminology, specific tactics, or a different approach, strategy, or way of thinking. What does my client need to do to move forward? Identify the items that must be provided and the homework and tasks your client needs to complete so you can do your job and the project can advance to the next step. What does my client need from me to be happy? Identify what the client expects and wants from you—the things you must deliver or the feelings you must create to affirm that hiring you was a great idea. What is the positive outcome/result of this step? Identify the achievement associated with completing this step of the process and the benefits of reaching this milestone. So, if I were a web designer, I would answer these questions five times—once for each step of my process, including discovery, design, development, launch, and training. Third, review the collective set of answers for each step of your process to gain information and insights on how to best manage your clients throughout the process, from start to finish. Remember, while project management is all about managing the project and staying on time and on budget, client management is all about managing the client and making sure they are well cared for and supported. A client management system meets the client where they are at with the information, tips, tools, and resources they need to move forward. What I can I offer clients to support them during this step of the project? Identify what items you could create and provide to clients to communicate what they need to know, teach what they need to learn, explain what they need to do, and make the client happy. This could be hand-crafted emails, phone calls, tips sheets, ebooks, video training, worksheets, and more. What could I do or add to make my clients’ experience remarkable? Identify little things you can do or small things you could add to really stand out, wow your clients, and take their experience over the top. Fourth, create your client management system. Now that you have identified what exactly emails, phone calls, tips sheets, ebooks, video trainings, worksheets, and/or other materials you need to create for each step of your process, it’s time to get them done. Prioritize the items that need to be created by ease and impact. What will be the easiest to get done and what will have the biggest impact on the client and the overall success of the project? Block out time in your schedule to get them done. Creating all of the content for your client management system is going to take time, so schedule uninterrupted blocks of time in your calendar to dedicate to getting it done and consider setting it as a weekly recurring event until you’re done. Reap the benefits of your hard work right away. While your time and energy is focused on creating your new client management system, you’re going to have less time for tasks like blogging and content marketing. Repurpose the content you’re creating for clients and publish it on your blog. If you don’t have time to create an entire client management system from scratch and implement it in your business, check out Profitable Project Plan, my done for you client management system for freelancers who sell WordPress websites. QUICK TIP: Don’t try to do it all at once. Creating a step-by-step client management system for your entire process will be a lot of work, especially if this is a totally new concept that you’re implementing in your freelance business or agency for the first time. A client management system requires you to put in the time and effort to plan it, organize it, create everything you need for it, and implement it. But the best part is that you can get started right away, even if the whole thing isn’t done! Instead of waiting until the entire client management system has been completed, begin using what you have created as you finish it—it’s a great way to test as you go. Fifth and finally, decide how you’re going to implement and use the client management system that you created in your business. Will I manually manage the system? Will I use a third-party system like Basecamp to house the content and materials or keep them on my own computer to use as needed? Will I delegate the process? Is there a trusted member of my team who could manage this process and make sure the client gets everything they need when they need it? This position is often referred to as a client care coordinator. Will I automate the system? Can I automate the client management system to free up my time and the time of my team members? Are there only parts of the system that can be automated? What are the triggers that will kick off the automation? What software do I already use that could handle this or do I need to invest in new software? If you struggle to get great testimonials, sometimes drop the ball on wowing your clients with extraordinary experiences, or find it hard to juggle caring for the client and doing the work you were hired for, a client management system — especially one that is automated like Profitable Project Plan — is the perfect solution. Follow the five simple steps outlined in this article to create your own client management system, and as soon as you have part of it created, start using it. Then continue to add to your systems as you complete more and more of it until the entire thing is complete and automated.